This Halloween Breakfast Invitation stayed out all day long and was a HUGE hit. We actually keep all of the Breakfast Invitations out for an entire day. By dinner they have been well loved, and have eggs smeared somewhere on the middle of the white paper roll. At that point, it is straight to the recycle bin. For those Breakfast Invitations that we want to revisit, we can create again. Remember, Breakfast Invitations should take about 5 minutes to create so they can be whipped up in an instant. Reuse materials so the only thing you need is new paper. Now for the Simple Setup! Tape down a portion of your white paper roll. Use masking or painter’s tape to adhere the four corners. 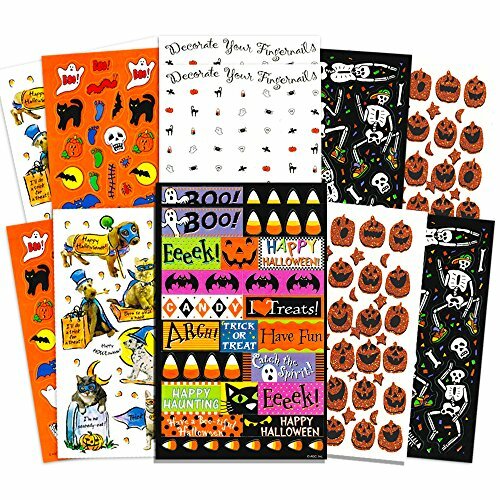 Place a collection of Halloween stickers in a small bin. Draw about 4 or 5 shirts on your Breakfast Invitation. Invite your toddler or preschooler to decorate Halloween shirts. Tip: Take off the backing for easier sticker peel. For starters, fine motor is going strong. See those little chubby fingers grasping the sticker? That is my three-year-old strengthening those small hand muscles. it’s fun - reason enough for me! Design your Halloween Shirt is also great for after school, before dinner or just in the middle of the day when you need to give yourself a minute to catch your breath.